'Marvel Rising,' 'Stranger Things,' 'Shooter' And Some Premiere Dates to Keep in Mind! Marvel is launching a new animated franchise arm of their power-house production team and it's called Marvel Rising. It's going to be a multi-platform animation franchise and it will be used to introduce the next generation of Marvel heroes, and it's set to launch sometime in 2018. The first offering will be Spider-Gwen, as Ghost-Spider, which will have six four-minute shorts. 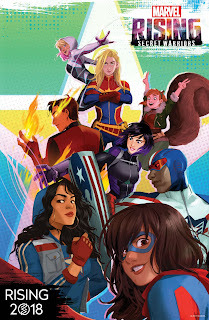 After that, where we'll be introduced to a number of new characters, a feature-length animated project will come out called Marvel Rising: Secret Warriors. Dee Bradley Baker will be gruffing it up as Lockjaw and other animals. ***Yes, Agents of SHIELD Chloe Bennet, who plays Quake in that show, plays Quake here in this series. That's perfect! Neflix is going ahead with its final season of House of Cards, sans the alleged sexual predator. For what it's worth, CBS extended the episode count of Elementary by eight! Ghosted got six more episodes ordered to it's cautionary short season from Fox. Kevin Can Wait got it's original number of episodes increased from CBS. SWAT got an expanded episode order from CBS. Berlin Station was renewed by Epix for its third season. Shooter is getting a third season from USA. The show stars Ryan Phillippe. Stranger Things got an order from Netflix for a third season! I Am Sam Kinison is a documentary on the late comedian, premiering on Tuesday, Dec. 19. The Amazing Race returns for its umpteenth season on Wed., Jan 3. HBO's Divorce second season will premiere on Sun., Jan 14. Big Brother returns to CBS on Wed., Feb 7. Survivor returns for a new season of desert island abandonment on Wed., Feb 28. Seeing Allred will premiere on Netflix in early 2018. It's a documentary covering the life of Gloria Allred. You can catch an entire list of premiere dates on my Premiere Date List page.